According to WHO Study Report, 2014, Delhi is the most polluted city in the world when it comes to air quality. Needless to say, air pollution level in Delhi remains very high round the year +(much worse in winter). Delhi has witnessed sudden spike in air pollution level leading to "very severe" category in early November. The city has been blanketed with smog leading to poor visibility and peopleare advised to stay indoor. Delhi Chief Minister has announced a slew of emergency measures among others shutting down schools, power plant, DG sets, construction activities, etc whereas 15 years old vehicles and entry of trucks passing through Delhi were banned. National Green Tribunal (NGT), a Supreme court appointed Bench, ordered drastic measures to curb air pollution. The air pollution is a complex issue and has many dimensions. There is a regional dimension to this problem.The recent spike in air pollution level has baffled experts as well. The crisis situation has, however, opened up opportunity to rework strategies to control air pollution in the long term. Rapid rise in pollution due to stubble burning, brick kilns, stone quarrying, plying of diesel driven vehicles are contentious issues and require resolutions. However, emissions originating from sources like dust accumulation, burning of diesel and petroleum products, production of toxic chemicals, would have to be curtailed. According to a 2015 report by IIT Kanpur 38 per cent of particulate matter (PM) 2.5 and 56 per cent of PM10 in the air is because of road dust. Sweeping of road dust causes huge dust emission and clogs road drainage system. According to news reports, the Delhi government’s proposed vacuum cleaning of roads to trap dust hasn’t commenced as firms that have the machines do not seem interested in lending them while efficacy of the machines is being questioned because of uneven roads. Washing roads with water at regular intervals would be a preferred solution which could be commenced from November itself. Washing roads would not only arrest dust emission but also help in cleaning of drains. Simultaneously, road side plantation work should be intensified to arrest dust. Construction of buildings in Delhi-NCR cause high dust emissions. The construction technology (manual mixing of cement, sand, stone chips in open space and RCC castings) being adopted is highly polluting. Prefabricated modular structure construction technology is less polluting and should be used for construction. Vehicular pollution has become a health hazard besides polluting air. It is reported that number of vehicles in Delhi alone is more than that of Mumbai, Kolkata and Bangalore put together. The vehicles emit volumes of exhaust fumes and gases which severly impact human health. To protect health, country’s fuel refineries are undergoing modification towards making clean fuel that complies with BSVI standard. There is also a need to check growing number of vehicles in Delhi through imposition of taxes and disincentives for owning old and second vehicle. The city’s public transport system needs to be improved. Delhi government has planned to add 1,000-odd more buses this year. Sadly the augmentation of DTC fleet is in limbo. Delhi Circular Railways (Ring Railway) that operates along a 35kms-stretch has not received adequate focus.This mode of transport, introduced in1982, remains grossly underutilised due to the lack of last mile connectivity and reduced frequency of trains resulting in lower passenger traffic. The ring railway needs to be strengthened and popularised with increasing frequencies and provision of last mile connectivity.The system will help reduce traffic on the ring road thereby containing vehicular pollution. The railway ministry had announced the Ring Railway revival plan in its 2016-17 budget. However, there appears to be little headway on both the fronts. Containing air pollution to this magnitude is a daunting task in the absence of effective regulatory framework. The Central Pollution Control Board has the statutory power to issue closure orders or cut electricity or water supply to industries that do not meet norms but it cannot penalise erring municipalities. This leads to lack of enforcement especially when dealing with municipal waste. Waste burning, accumulation of huge garbage in dhalaos and frequent smoke and fires in landfill sites aggravate dust pollution. Segregation of household waste at the individual level needs to be promoted to avoid mixing of waste and complex segregation operations undertaken at the garbage dumps whereas vegetable and kitchen waste could be composted. A few composting plants involving citizens have already come up. There are innovative schemes, waste reduction and user friendly recycling programmes for disposal of hazardous waste, bio-medical waste and e-waste. Instances of non-compliance of regulations on the disposal of bio-medical waste by hospitals, labs and blood banks have been reported. However, municipalities need to be adequately supported for establishing state-of- the- art- waste management facilities. It is possible to design these facilities for carrying out their operations with government’s support. Three waste to energy plants in Delhi are operating sub-optimally whereas another plant is going to be commissioned soon. Industries in Delhi generate hazardous waste but there is no dedicated facility to treat the waste whereas the Hazardous Waste Management Act prescribes establishing of such facility. Delhi Pollution Control Committee (DPCC) has been entrusted with onerous task of monitoring pollution control work in Delhi.There are many small- and medium-sized industries flouting pollution norms. Strengthening DPCC with induction of domain experts from multi disciplinary subjects backed by infrastructure with proper road map will go a long way. 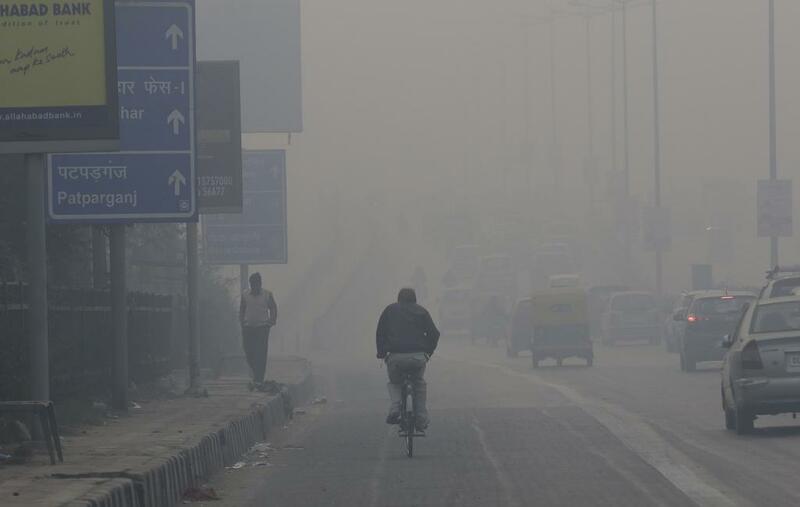 Delhi being national capital remains in the news, however, 32 other cities declared heavily polluted (WHO,2016) deserve urgent attention.To address this, region-wise institutional mechanism should be set up in the country wherein states will deliberate and monitor periodically air quality, environmental standards and environmental issues and also suggest corrective actions.